YOUR BEST SOURCE FOR PRO AUDIO GEAR. 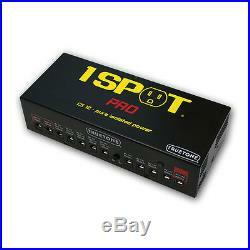 Truetone 1 Spot Pro CS12 Pedalboard Power Brick Supply w/ 18V 12V 9V Outlets. 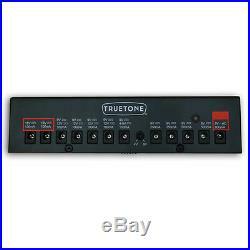 Truetone 1 Spot Pro CS12 Pedalboard Power Supply with 12 Outlets. For many years, Truetone has made musicians' lives easier with the 1 SPOT, the original compact pedalboard power supply. It works so well that a lot of musicians never felt the need to get one of those brick-style power supplies, and we here at Truetone didn't see the need for those either, even though they were quite popular. Bob Weil, founder of Truetone, explains. A lot of people over the years had told us that we should make a power brick. Even some of my own staff urged me to do it, but I didn't want to for two reasons. First, I knew the 1 SPOT could power just about every pedal out there, so I didn't see the need. Second, I didn't want to make just another knock-off of someone else's power brick. If we were going to make one, we were going to do it our way and have features that nobody else could offer. As pedal designs changed and it became more common for digital pedals to require isolation and for others to need something other than 9Vdc, I finally saw a reason for us to design a power brick. It took 3 years and lots of experimentation, but we were finally able to design a 1 SPOT Pro, using our own proprietary technology to give musicians all the features they need for today's pedalboards. The original 1 SPOT still works great for most musicians, but for those who need more power and versatility, the 1 SPOT Pro fills the need perfectly. What does that mean and why should I care? Technically, it's switching power supply technology, which is very different than what anyone has ever put inside a power brick. 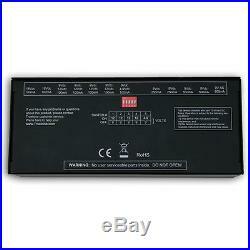 Normally, you would find just a big transformer and a handful of small electronic components inside a power brick. Old tech that hasn't changed in decades and has a lot of limitations. We took the same switching power supply technology found in our famous 1 SPOT and scaled it up to make the 1 SPOT Pro models. With much more space to work with, we were able to completely eliminate noise, provide total electrical isolation between outputs, create multiple voltages, and still give you the ability to use it anywhere in the world. A major benefit of using a switching power supply is that it can handle far more current (power being pulled out of it) than any transformer-based power supply. For example, you can connect a 300mA pedal to a 200mA output, without causing any problems. With a transformer-based power supply, you can't get away with that. The important thing is to not exceed the total of all the labels. With a CS7, the output labels add up to 1900mA total. That means the total current draw of all your pedals should be less than 1900mA. 8.12" x 3.37" x 2 (206 x 86 x 50mm); 2.35 lbs. Weight and dimensions of power supply only, not including cables or packaging. The item "Truetone 1 Spot Pro CS12 Pedalboard Power Brick Supply with 18V 12V 9V Outlets" is in sale since Friday, August 12, 2016. This item is in the category "Musical Instruments & Gear\Guitars & Basses\Parts & Accessories\Effects Pedals\Power Supplies". The seller is "*pitbullaudio*" and is located in National City, California. This item can be shipped worldwide.